The £3699 oBravo EAMT-1s - the world’s most expensive in-ear headphones? | What Hi-Fi? 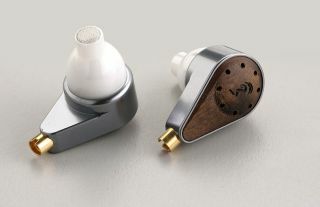 The £3699 oBravo EAMT-1s - the world’s most expensive in-ear headphones? How much are you willing to spend in the pursuit of perfect sound? How about £3699 for the EAMT-1s? They use a custom-design Hybrid Dynamic AMT drive unit and can be used with smartphones and portable audio players. oBravo is used to dealing with exotic headphone technologies, it esponsible for the world’s first pair of headphones to use a Hybrid-Planar driver for example. But that was for a pair of over-ear headphones, which gave oBravo a lot of space to work with. Now the company has managed to shrink a new Hybrid driver technology down to fit into a pair of in-ears. The Hybrid Dynamic AMT driver is a coaxial design, where two driver types are combined into one singular unit. The two driver types are an 8mm Air Motion Transformer (AMT) tweeter and a 10mm Neodymium Dynamic Driver (NDD). oBravo says the unit is capable of reaching lows of 15Hz and highs of 45kHz. The coaxial drive unit is housed within a Precision-Ceramic hand-crafted body that weighs 35g. While it’s likely you’ll need top-performing source equipment to get the best from the EAMT-1s given their price, oBravo says they’re sensitive enough to be used with a wide range of smartphones and portable audio players. The EAMT-1s are available now exclusively through Audio Sanctuary, where you can at least try them out, even if you can’t afford them.